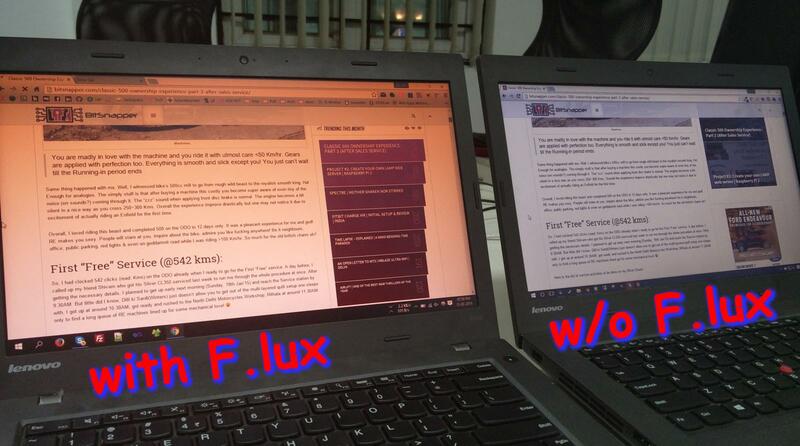 f.lux is a really handy tool that allows you to adjust the color temperature on your display. If you stare at a screen for too long, then the glare from the display begins to hurt your eyes. To start with, turning down your monitor’s brightness may help you, but brightness is not the real issue. The color temperature is what causes the problems. Most computer screens emit a bluish light, which looks great in the daytime, but it becomes uncomfortable to look at when the sun dips below the horizon. Not only can your screen become uncomfortable to look at, it can also affect your sleep patterns*. F.lux works by calculating the approximate sunset time for your location. At sunset, your computer screen will mimic nature, gradually warming up the colors. This, in turn, blends in better with the surrounding light. The app is very easy to navigate and configure in a few clicks. the adjustments can be made with sliders across the main window, which alter the daytime and nighttime calibrations. *There has been researching which suggests reading on a tablet for a couple of hours before you go to sleep can delay your sleep pattern by approximately an hour. Let’s first start with f.lux 3 which was somehow the first version of f.lux and was actually better than the new f.lux 4 beta which is bloated with not needed features. The f.lux developer’s main assumption is that blue light is bad for your sleep. Not exactly bad, but we are made to have day and night cycle of light and at night you should lower blue light to sleep better. This is good. This is true. Melatonin secretion stops when our eye sees blue light. But do people problem is actually bad sleep or it is eye pain? I and 99% of all other people who use blue light reduction software use it because we feel less eye strain when we remove the blue light from our screen at night. So I don’t actually need this day and night cycle of the Sun thing. I don’t actually need to sleep better. I train a lot, eat good and even with a cup of coffee before bed I sleep well. What my problem really is is that I feel a lot of eye pain from my constant work in front of computer screens. This is a fundamental problem. I don’t need all of this day and night graphics of how light affects my sleep and what value is best to sleep better. I just want 1 slider with 0% and 100% blue light. That’s it. I want to set the blue light to my comfortable value and maybe automate this based on the time of the day. It’s not only the melatonin suppression effect. It’s the strong wavelength of blue light which enters deep into our retina causes eye strain and macular degeneration in the long run.